The SCREEN-WELL® Epigenetics library contains 43 compounds with defined activity against enzymes which carry out epigenetic modification of lysine. It also includes DNA methylation inhibitors. Compounds are dissolved in DMSO at 10mM and aliquoted into deep-well plates at 100 or 500µl per well. The library is a useful tool for chemical genomics, assay development and other pharmacological applications. The library contains inhibitors of these important enzymes: HDACs, SIRTs, Lysine demethylases, HATs, Histone methyl transferases, DNA methyltransferases as well as SIRT activators. A variety of structurally and mechanistically different compound classes are included. Download our Application Note: A Flexible and Robust Solution for Automated 384-well HDAC Profiling." Application Notes: Useful tool for chemical genomics, assay development, or other pharmacological applications in the study of epigenetic modifications of lysine and DNA methylation. Contents: 43 compounds supplied in DMSO at a concentration of 10mM. 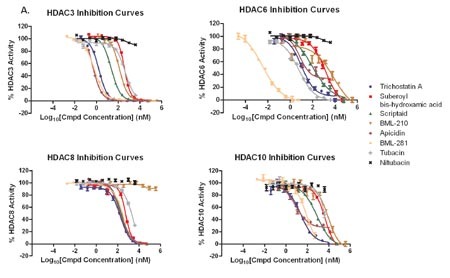 Application Note: Automated, High Throughput, HTRF®-Based Detection of Histone Methyltransferase and Demethylase Enzyme Activity. Application Note: An Automated Profi ling Application using a Direct, Cell-Based, Target-Compound Interaction Assay for G9a Histone Methyltransferase and Bromodomain Proteins.